Are you ready for the most adorable bag in the world? And it’s not only adorable but also one of the most popular and iconic bag in the fashion industry. Meet the Boy Chanel Chevron Chain Flap Bag from the Fall Winter 2017 Collection. 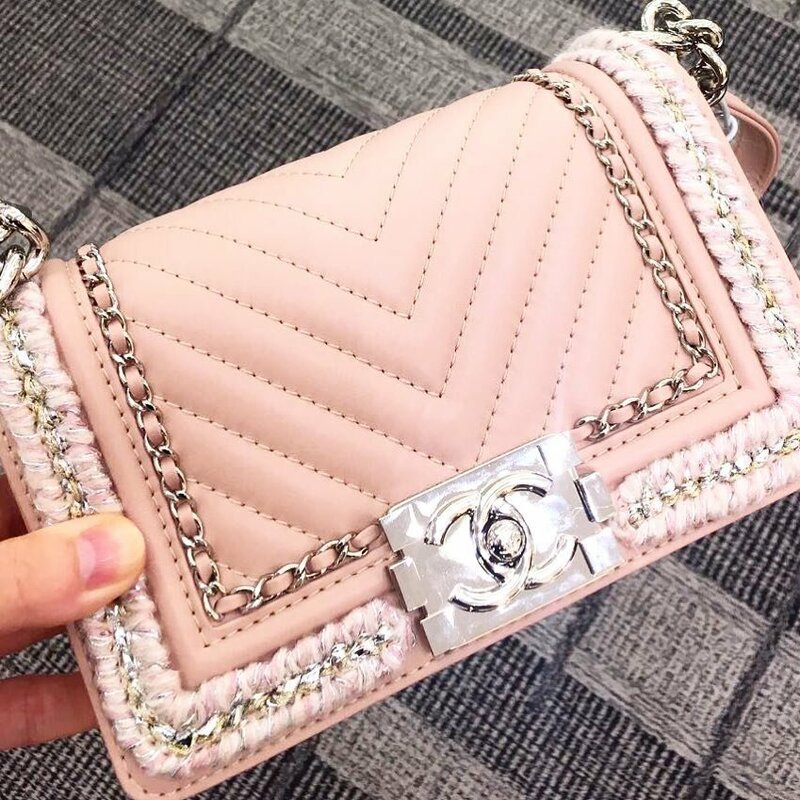 There is a lot to talk about, but first we want to remind you that this design looks like an extension version of the Chanel Woven Chain Leather Around Bag. It’s a more complicated version, but I love it, so do you? There are different colors available, but this light pink is very attractive. There is a lot going on with this bag – first the front flap is crafted in chevron quilting and the stitches are very clear. The chevron adds an elegant touch. Then it’s embellished with woven chain leather strap around the center. But most importantly, on the edges of the flap, it’s refined with tweed mix with golden chain, this combo completes the look and makes it one of the best Boy Bags in Chanel’s Classic Collection. Of course you can stick with the original Boy Classic Flap Bag, but this is just another option to choose. For those that are interested, this bag comes with a large boyish chain for shoulder and cross body carry. The interior is made with one large compartment and a zip pocket. It can store all your daily essentials. Check for more sizes via Chanel Classic Boy Bag Overview. We do not know the price yet, check with the SA at the boutique.